Speedway superstar Jason Crump will be in the line-up at the Braintree Bonanza on the December 27, at the indoor Towerlands Park. Jason tested at Braintree on Monday, the first time on a bike since the last operation on his arm in October, and has confirmed he is fit to take his place in the 32-rider field. Braintree promoter Pete Boast said: “We are over the moon to have Jason riding with us. 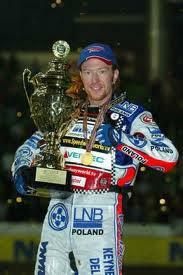 I've known him for few years now and he rode one of my bikes at a Scunthorpe practice and really enjoyed himself. “I had thought about asking Jason to come race previously but in the summer he's flat out with speedway and in the winter he goes back home to Aussie. “However, last week he called me to say that he was staying in England this winter and asked if we could fit him in at Braintree, on the condition that he could practice to make sure is arm was back up to full strength. I'm pleased say all went well in practice and he is looking forward to racing at the indoor venue. Shorttrackers: Jacopo Monti (Italy), Chris Boone (USA), Aidan Collins, Pete Boast and Tom Woolley. The entertainment starts at 12 noon with the Marxman Marching Band and racing at 1pm.